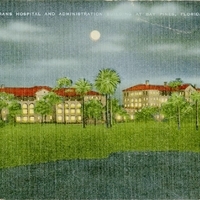 A postcard depicting the Veterans Hospital and Administration building at night in Bay Pines, Florida. Construction for present-day Buildings 1, 2, and 13, as well as a gatehouse and an employee living quarters, was completed in 1933. Originally called the National Home for Disabled Volunteer Soldiers, the hospital, along with the domiciliary unit, opened on March 16. As a whole, the site continued to expand in acreage and in the number of buildings over the next several decades. Originally created by E. C. Kropp Company and published by Sun News Company. "Our History." U.S. Department of Veterans Affairs. http://www.baypines.va.gov/BAYPINES/about/history.asp. E. C. Kropp Company. “Veterans Hospital and Administration Building at Bay Pines Postcard.” RICHES of Central Florida accessed April 19, 2019, https://richesmi.cah.ucf.edu/omeka/items/show/6790.